A sheet material made from compressed wood fibre chips and resin or glue, Chipboard is a manufactured material with a very smooth texture on the sides thanks to how it is made. The edges are generally rough and require a veneer for an appealing finish. This is a very low cost material that is frequently used in assembly furniture, kitchen worktops and other laminated surfaces. Among its other benefits, chipboard is also more environmentally friendly than solid wood options as the fibre used in its manufacture is usually recycled from previous use. When exposed, it is susceptible to water damage, but this is easily overcome with efficient sealing and veneers. It is often compared to corrugated cardboard, though it has two key strengths that corrugated cardboard lacks; it is cheaper and it is stronger. 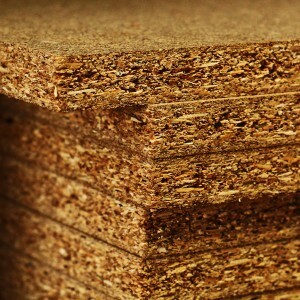 Chipboard comes in varying densities such as high density chipboard, which is ideal for furniture or kitchen carcasses.